An ‘action-packed’ month, filled with interviews, lots of matched betting, plus a short trip to Hong Kong to see my poorly Grandma (getting better but not fully recovered). My ‘income’ this month has been derived from the last of my pay-in-lieu-of-notice (PILON) from my last job. So, how have I done in March? After last month’s record-breaking savings rate, it’s back to a good solid savings rate of 58.6%. This pushes my average savings rate so far to 64%. As I’m still only at interview stage with regards to my job hunting, it’s highly unlikely that I will have a salaried wage in April. As I have always worked out my savings rate to be what I save from my normal working wage, this means that my savings rate is going to be a big fat ZERO! I know others calculate their savings rates differently but I’m just being consistent with my own calculations. I think I’m likely to continue to invest using matched betting and other income – I guess others might not save/invest whist unemployed but I feel that I need to keep the saving/momentum going, even at a reduced rate. At least in the short term, anyway. March’s savings was boosted by the £50 I won in Premium Bonds, £50 from rent received, £292.40 Jobseekers Allowance (ahem, continuing to make the most of ALL my income while I can), £14.62 from TopCashback*, £250 matched betting profits and I was lucky on the lotto again so another £10 win has been chucked into the pot too. As mentioned in my last post, I hit my biggest milestone so far, that of reaching £100k in savings/investments. With Brexit triggered and more Trump shenanigans in the news, the markets wobbled a little but my Future Fund ended up at £100,442. Total income received was £111.61. In March 2016, I received £29.81. 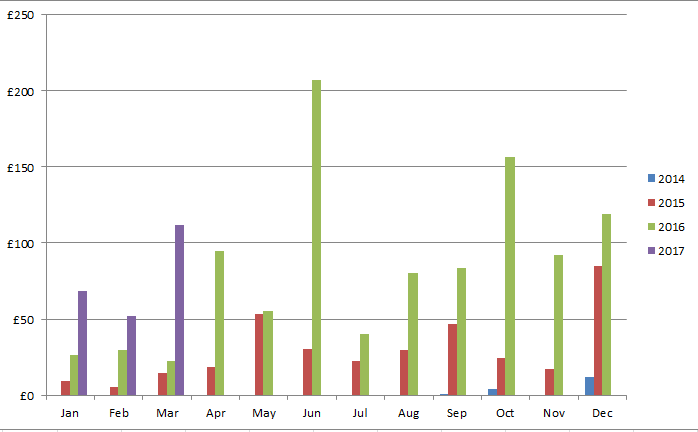 A great year-on-year increase, continuing to make steady steps towards my goal of £1,500. 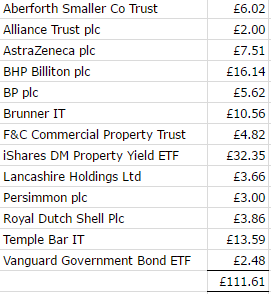 Total dividend income now stands at £231.90. Good to have my first month where income is >£100 – last year, there were only 3 months where I achieved this (June, Oct and Dec), so this is a great start. Also good to see dividends start coming in from some of my Dog shares, namely AstraZeneca, Persimmon and Royal Dutch Shell. I also received £15.74 from my P2P and Property Crowdfunding investments. I made a new purchase in Edinburgh Investment Trust. I also added to my property crowdfunding* investments using some matched betting profits. Current share and IT portfolio can be found here. First off, a massive thanks to TheFireStarter who did me a huge favour this month at very short notice. Without his help, there was a chance that I could have lost £200 – I owe him more than a few pints! So this month, I decided to try ramping up my MB activities, including doing more horse racing and more football accumulators (accas). On the horse racing front, I took part in the Cheltenham Festival offers, which many matched bettors see as the best four days in the calendar. My winnings for the festival were a modest £400 as I kept my bets fairly small (between £10-£20) – my strategy was the long term preservation of my betting accounts by (hopefully) not drawing undue attention to them with big wins. The sheer number of offers available and me trying to do as many as I could (and trying not to make mistakes) meant that the 4 days were both exciting and stressful! On the acca front, at one point I had between 15-18 accas going at the same time. Running so many simultaneously meant there was a real risk of making mistakes (and I did), such as forgetting when matches were on etc, and I was forever double-checking my numbers to make sure I had done correct backs/lays. Again not fun, but profits were increased. So, I hit another milestone this month, that of making over £1k in a month for the first time from MB – my total profit for March was £1,270. This was all from football and horse racing MB only. After two relatively poor months, I’m now on track for my MB goal of £4000 profit. I think I will continue to do some horse racing as well as football but I certainly won’t spend as much time as I have done this month on MB – I want to continue to enjoy it, not be stressed by it plus, MB plays havoc with your social life! The matched betting guide I subscribe to is OddsMonkey*. It’s a great website for beginners and experienced matched bettors alike – for beginners, there are plenty of tutorials which provide you with step-by-step guides on how to make profits and to work through special offers. They also offer one-to-one sessions for those who need a little more help – I believe these sessions are very popular as there is sometimes a waiting list. For the more experienced, the tools offered by OddsMonkey are fantastic, including the Each Way Matcher, Dutch Finder, Racing Matcher and Acca Matcher, all of which I have used successfully. There’s also a friendly forum for you to ask any questions. Anyway, you can join for free* to try it out. Hope everyone had a great March. This entry was posted in Dividend Investing, Earnings, Expenses, Funds, Investment Trusts, matched betting, Portfolio, Savings, Shares by weenie. Bookmark the permalink. What acca’s are you doing regularly? Assume as you talk about lay – lock-ins? I do a few of these but find that only really Will Hill are consistently profitable. Considering moving to no-lay! Yes, I do lock-in accas and my main earners are Will Hill and Paddy. The latter allows you to be able to claim up to 4 free bets on the same day so more flexible than WH, although I don’t think I’ve had more than 3 finishing on the same day. Others I do regularly are Ladbrokes and Betfred, although for smaller profit, they add up if you have the time to do them. 188Bet was a nice earner too although they’ve now pulled their acca offer. I also do Betway’s acca offer (£25 treble to get 2 x £5 free bets) – these won’t be lock-ins, just go for a low QL to get the free bets the following week. I did try no lays but I don’t think I’m very lucky with them and although in the long run, due to the EV, I know there will be an overall profit, I couldn’t stomach the losses in the meantime! Best of luck with them! Ha, yes I can’t stomach losses either. Unfortunately I can’t place bets on PP due to work, but will give it a good go at doing a number of these. Does seem a pretty straight forward, repeatable way to earn. Awesome matched betting profits weenie! Just goes to show that even by keeping it (relatively) simple and hitting a few types of offer repeatedly you can churn up big profits in just the space of a month. Now onto the masters golf (so many extra places!) and the grand national although not many offers around for the latter, this is my fav weekend of the year betting wise. I’d really like to add my monthly dividends up but with half of my purchases I opted as Inc and half Acc, I’m not sure if that’s possible and even if it is it seems really complicated and time consuming. Is there an easier way to do this I’ve totally missed? All the best for your April endeavors…! Inc dividends are obviously easy to spot, Acc need a bit of effort to work out – good old Monevator has covered them here: http://monevator.com/accumulation-funds-dividends/ . There seem to be lots of steps to do it, so perhaps something to do when you really feel the urge to add up your income! My broker (AJ Bell) sends me a note anytime a dividend has been credited to one of my accounts – and that goes for my Accumulator units in the fund I am holding as well.Doesn’t your broker do the same? In addition to this the fund I am holding publishes the income history for its Acc and Inc version on its own website – might be worth digging around a litte bit on the websites of your investments. Which holdings is it that you have problems with finding this data for? Hargreaves Lansdown don’t send emails when I receive dividends, I have to log into my account to check! However, when I click on one of my investments with HL, they will give a summary of what income I have received from that investment, which I don’t think is available with AJBell (or maybe I haven’t discovered that functionality?). Careful with the jobseekers and declaring assets. I have got into trouble there in the past. Make sure you tell them what you’ve got or they’ll be out with the thumbscrews! I’m sure you’ve done it right – but just in case.. 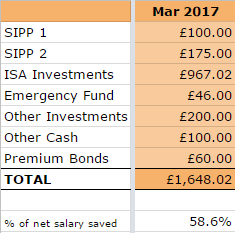 I declared my savings as being >£16k and was still able to get Jobseekers. I didn’t bother to try to claim Income Support or Housing Benefit as those are definitely means tested. Not sure about Council Tax – didn’t bother with that one anyway as I already get sole-occupancy discount. I wasn’t sure that I was entitled to any benefit at all to be honest so grateful for this small amount. Very jealous of that massive matched betting profit ! I started matched betting around a year ago and have been ‘gubbed’ by every bookmaker worth having, I now make between £200 – £400 per month ‘arbing’ using the accounts I am not too heavily restricted with, which I am still very grateful for and quite enjoy. And being 22 and at the beginning of this financial independence journey that money is a really significant amount to me, the consensus on the internet seems to be that losing accounts is inevitable and ‘mug betting’ and other strategies cannot guarantee this wont happen, perhaps that’s why I decided to ‘make hay while the sun shined’ and took every offer and arb I could. What’s your experience been with losing accounts? Beleated congrats btw on passing the 100k mark, very inspiring I hope I get there one day! If you want to see impressive matched betting profits, check out the >£4.5k that Guy made in March: http://www.matchedbettingguy.com/2017/04/ – no wonder he’s going on a 3-week honeymoon to Orlando! I’ve been matched betting for a year too and have been gubbed by the following (in order of gubbing): BetVictor, Stan James, Coral, Unibet, Toals, GentingBet, SkyBet, 888sport. So, I’ve still got all the ‘biggies’ for now and treading carefully to try to keep my accounts as long as possible. As you say, losing accounts is inevitable, but rather than ‘make hay’, I’m hoping to sneak ninja-like under the gubbing radar! Just seen that you have started a new blog. All the very best with your FI journey – at the tender age of 22, you have sooooo much time on your side, a lot of time to accumulate and pass the £100k and beyond! Oh I forgot, I also lost Betfair Sportsbook pretty early on too. I think your strategy is far superior to mine thinking about the longevity of your accounts rather than me taking the foolish short sighted view. Lets hope so as TwentytoNotVeryMuchReally doesn’t quite have the same ring to it lol! I lost Betfair Sportsbook early aswell, they are fantastic for arbing though so i cant complain ! That’s weird, I’ve had plenty of mileage out of betfair sportsbook. But probably don’t do very many offers compared to you guys. What offer were you hitting regularly to get gubbed, was it a good one? I didn’t actually do that many offers with BFSB. I was gubbed shortly after I’d taken up the offer where you got £5 FB per goal for the PL player you backed to be golden boot (I got 4 x £5 from Aguero). Congratulations on the great results from the MB, coupled with the great looking dividends graph, things are really starting to motor along, only a matter of time now before that future fund breaks the £150. As you will read everywhere, the first £100k is the hardest. Yes – and it really helps the snowball get going, however then its another £900k to get the next extra 0 at the end so it can feel a slow journey! I’m counting on the snowball effect as my investments will be somewhat reduced over the coming month(s), due to no main salary but I will keep at it nonetheless with income from my ‘side hustles’. I’d not be able to retire at all if I was aiming to add £900k to get that extra comma, so it’s fortunate that I won’t need that much in the end! Ouch, I hope you were still able to enjoy a bit of ‘wine time’ over the bank holiday!